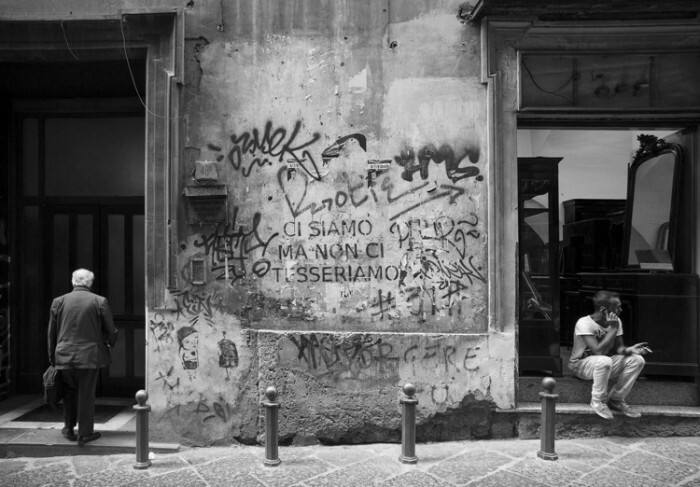 Personally, it’s taken me half a lifetime to get to love Naples; maybe I’m becoming more attune to the ways of Southern Italy, because I love both Naples and Palermo, their craziness and quiet pockets, their warm welcomes and lilting accents. After numerous visits, I’m starting to get to know the capital of Campania a bit better, but I’m no expert. 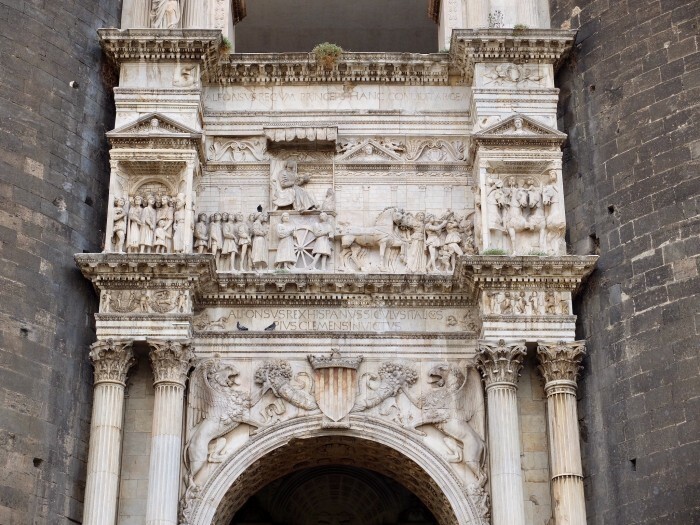 That’s why I asked my friend and colleague Vincenzo, who hails from neighbouring Caserta, to write a one-day Naples itinerary, an easy walking tour for a first-time visitor. One day is just long enough to become spellbound by the city’s southern charm and hit the main landmarks in order to plot your return. Below, follow his handy guide of places, food and things you should experience during your one day here. Before getting started with your Naples walking tour, grab a quick coffee and sfogliatella. Despite all of Italy being known for its coffee, you’ll be sure to find the best one here (I say that because I am from down here). In Italy, coffee, or espresso, often has a strong flavour, leading to its usual pairing with a croissant. But for the best southern experience, swap the croissant for a sfogliatella: a classic Neapolitan pastry made with ricotta cheese, candied citrus peels and spices. There are two types of this delicious treat: the shell-shaped “riccia” and the “frolla,” which is shaped like a small ball dusted with powdered sugar. All the bars and bakeries here sell sfogiatelle, but one of my favourites is Pasticceria Attanasio in the central railway station area. It’s very affordable (2-3 euros per pastry) and runs almost 24/7, so you can stop by anytime to have your own little taste of heaven. In Italy, coffee is typically enjoyed at the counter, so you will probably find locals standing al banco chatting with a caffè in hand. You can choose to sit down at one of the tables, of course, but many bars will charge for table service (especially outside). Keep this in mind if you’re on a budget. Some bars allow customers to drink their coffee first and pay later, though sometimes, especially in crowded areas, you’ll be asked to pay first and show the barista your receipt so they know what you’d like to order. The policy differs in each bar, so eye some locals to figure out the best plan of action. Walk through the historic centre until you reach the street, Spaccanapoli. It means “Naples Splitter” and gets its name from how it seems to divide the city into two perfect parts. This street is the lower of the three streets (called “decuman”) that make up the original Greco-Roman town, Neapolis, and best represents the spirit of the city: on one side you’ll lose yourself winding through tiny streets full of history, legends and people strolling around while shopping or going about their daily lives, while on the other you’ll find more cultural aspects and can admire a selection of important historical attractions. This place is also known as the spot where it’s Christmas every day: here, you’ll find workshops displaying nativity scenes and terracotta statues depicting nativity characters (plenty of Jesus & Holy Mary to buy for your mom!) but also celebrities and politicians including Sofia Loren, Roberto Benigni, every single football player of the SSC Napoli – the city’s official team – and even Barack and Michelle Obama and the Pope. Walk along Via dei Tribunali to reach the gates of Napoli Sotterranea. After descending 136 steps you’ll be transported back to the 4th century BCE when the Greeks created these cavities to extract tufa stone for building the walls and palaces of the ancient polis and its water channels. The passages were extended by the Romans for conduits and cisterns, while more recently, they were used as an air-raid shelter during WWII. But the hidden treasure – literally – is 35 meters deep: the Hypogeum Garden is an area where vegetables, flowers and plants grow in the innermost part of the earth, a seemingly hostile environment, yet far from acid rain, smog and pollutants. It was created during Expo Milano 2015 and is now open to visitors, botanical students and anyone using the garden for scientific research. Once you are back in the sunlight, pay a visit to the Duomo di Napoli. The 13th-century Cathedral has the shape of a Latin cross with three naves and side chapels. It boasts a mixture of architectural styles from Gothic, Renaissance and Baroque to Neo-Gothic because it was built over different centuries and has undergone various phases of reconstruction. In addition to being the most important church in the city, it is also the place where the blood of San Gennaro (Saint Januarius) is preserved. 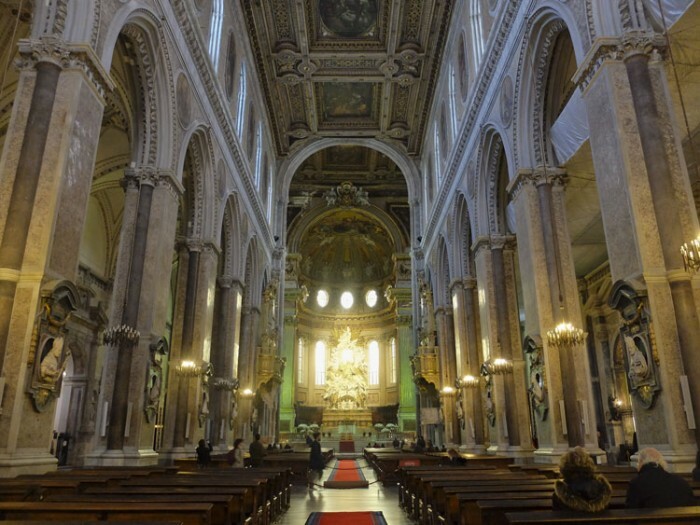 On the first Saturday of May and the anniversary of his death, September 19, faithfuls gather here to pray hoping for the “blood miracle.” It is said that if the holy blood of the Saint doesn’t liquefy, something tragic will happen to the city of Naples that year. This actually happened in 2016, but there were no consequences; despite having become folklore, it is interesting to witness devotees awaiting the liquefaction, such an important dimension of local culture. You can’t really say you’ve been to Naples without eating pizza… and a lot of pizza. The secret behind Neapolitan pizza is the dough: high, fluffy, seasoned with simple ingredients and baked in wood-burning ovens. Forget about double cheese, salami and other toppings; in the city’s typical pizzerias you’ll only find three options: Marinara (tomato sauce, oregano and garlic), Margherita (tomato sauce, buffalo mozzarella and basil) and Pizza Fritta (fried pizza). This last delicacy is something you can only ever find in southern Italy, and is made without a traditional wood-burning oven, meaning it can be fried and distributed rapidly from any food cart or restaurant with deep-frying abilities. The pizza can be served with the toppings either directly on the crust or stuffed inside the dough pocket. Although the thought of sitting at a table after such a busy morning is tempting, I suggest you to try the ultimate Neapolitan street-food experience, the pizza a portafoglio. This cheap, folded pizza has been a Neapolitan tradition since the 1730s, and is perfect for on-the-go dining. Folded in fours, the pizza a portafoglio is meant to be eaten from the curved rather than the pointy edge of the crust, in order to avoid spilling boiling tomato sauce and cheese. It is the perfect street-food experience and will make you feel like a real Neapolitan within seconds. If you’re not ready to end your deep-fried experience, opt for a cuoppo, a paper cone filled with fried goodies of all kinds – small pieces of pizza, rice balls and potatoes filled with salami and cheese. Or, if you’re looking for a tasty treat to top off your meal, try taralli, black pepper and toasted almonds wrapped in lard. With your stomach full of pizza, it’s time to hit the stores for some shopping. Via Toledo is a historical street with plenty of shops, historical monuments, and religious buildings, connecting Piazza Trieste e Trento and Piazza Dante, two of the most famous squares in the city. 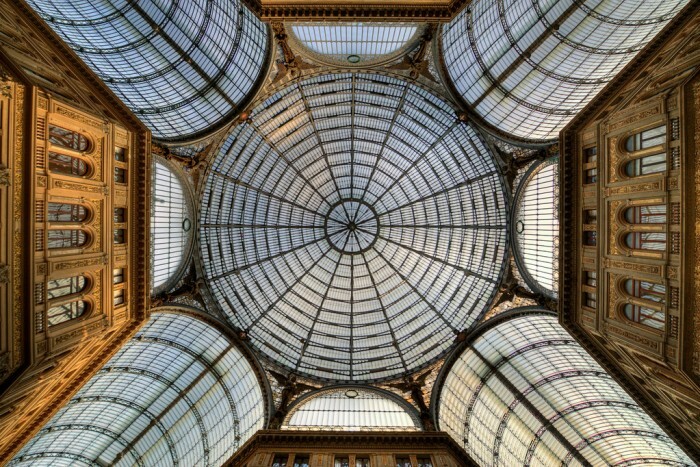 One of the must-see sites on Via Toledo is the Gallery Umberto I, a public shopping mall built in the late 1800s and modelled on the Vittorio Emanuele Gallery II in Milan. Topped by a high arched dome, the gallery combines public spaces, like stores, cafes and spaces for socializing, with private apartments located above. Dedicated to the king of the time, painting and mosaics fill the wall of the gallery from floor to ceiling, offering a spectacle for any traveller. For more urban art, head to the Toledo metro station. There is a large project to have famous contemporary architects and artists design and decorate the city’s metro stations; this one has a light and water-centred theme designed by Spanish architect Oscar Tusquets Blanca. Combining public transport with modern art, the Toledo metro station does more than just take passengers from point A to point B. It also showcases mosaics, LED-lights and wavy panels that practically immerse pedestrians in the sea. If you still have any time or energy left, or if you’ve opted against shopping, choose from some of the more cultural things to do in Naples that Alexandra wrote about on one of her visits. Journey to one of the most central squares in Naples, Piazza Plebiscito, to find a church reminiscent of Rome’s Pantheon located directly across from a royal palace. On either side of the church’s six-columned structure are additional columns that wind around the piazza to form a semi-circular shape. Two equestrian statues displayed in the piazza put the spotlight on Ferdinand I of Bourbon and Charles III of Bourbon. 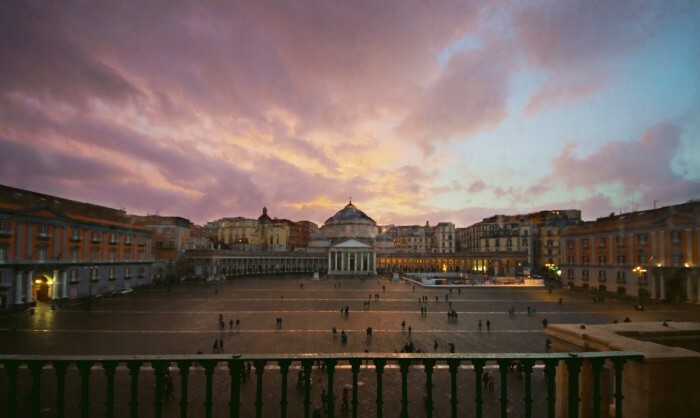 Set between the city and the seaside, the Piazza Plebiscito’s 25,000-square meters of open space also occasionally host open-air concerts and modern art exhibitions. And if you happen to stroll by at night, the columns are illuminated in alternating colours that span the entirety of the rainbow. 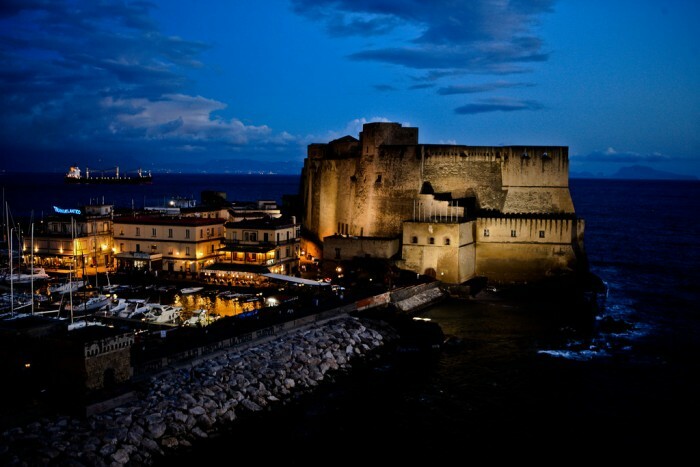 Nearby is the medieval Castel Nuovo, once home to the kings of Naples, Aragon and Spain. Built by the French in the 13th century, the castle has been deeply influenced by Italian and Spanish architects throughout the centuries. Inside, the structure houses a museum with cultural exhibitions and the history of the city. You’ll also find the Palatina chapel, vaunting Giotto’s fresco fragments, an Armoury Hall and a collection of Neapolitan paintings and watercolours. 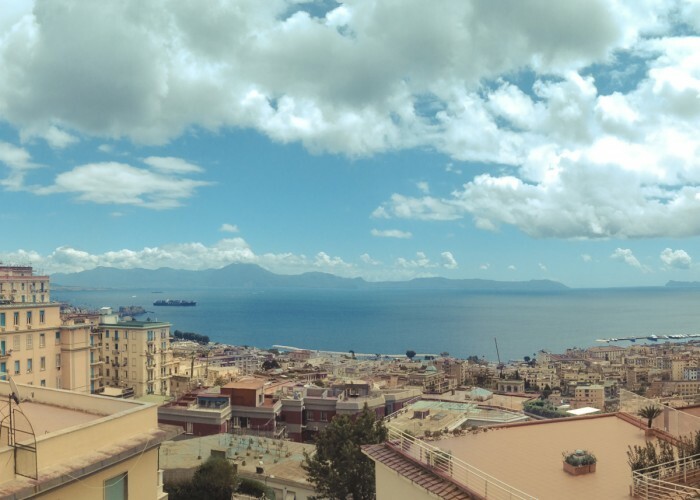 Overlooking Piazza Municipio, the castle was named to distinguish itself from Naples’ other castles, and also affords a fantastic view of the bay. To wrap up your evening, dig into fresh local seafood, which you’ll find at any number of restaurants near the shore. Whether you prefer fish, crustaceans or molluscs, Naples has everything on offer. Steamed mussels, sautéed clams and octopus with chili pepper and tomato are all staples of Neapolitan seafood cuisine. If you’re on a budget, Neapolitans prepare anchovies in a few different ways: fried (of course), raw and marinated in vinegar and dressed with olive oil, or pan-cooked with olive oil and lemon juice. While many of the available dishes are simple and low-priced, rest assured that Neapolitans never compromise on quality. After your meal, take a stroll down the city’s seafront promenade, Lungomare Caracciolo. Stretching almost three kilometres in length, the strip includes views of the bay, two castles and Mount Vesuvius. Vincenzo graduated in Languages, Literature and Intercultural Studies from the University of Florence with a thesis on the English and Italian Languages of Tourism. He now works at the communications agency Flod where he is an expert on social media content for millennials.